Bonfire Night may go with a bang for you and your family, but it is estimated that approximately 60 per cent of pets become stressed and fearful during the firework season. To make matters worse, not only are many pet owners unaware how to help their dogs and cats with firework fears, veterinary professionals believe 71 per cent of owners are unable to spot the signs that their pets are unhappy. Hints And Tips On How To Prepare Your Pet For Bonfire Night! 10. 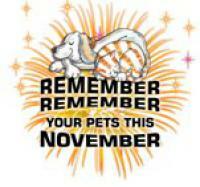 If you are worried that your pet is taking a long time to recover from the firework festivities, speak to your vet. For further information on how to prepare your pet for the firework season, please contact your vet or visit www.petfireworkfear.co.uk.